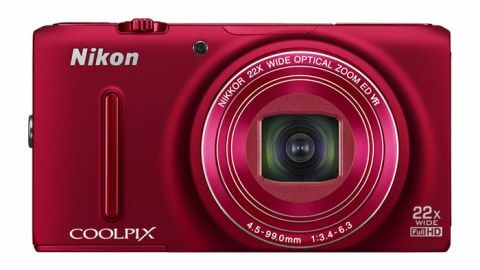 The Nikon Coolpix S9500 replaces the Nikon Coolpix S9300 at the top of the brand's Style range of digital compact cameras, and is designed for beginners and casual users. As is to be expected from a camera in this range, Nikon is providing a device filled with all the frills and thrills (3D, GPS, Wi-Fi, subject-tracking autofocus) but lacks the kind of controls that advanced users may want. The 22x optical zoom is a fair bit longer than the 18x zoom of its predecessor, and its range of 25mm to super-telephoto 550mm (35mm equivalent) is both wider and longer than you will find on most compact cameras at this price point and size. The 18.1 million pixel 1/2.3 inch sensor uses some of the latest CMOS technology, including back-illumination, which promises to enable the camera to reach high ISO values at this resolution without getting too noisy. With ISO settings going up to 3200, images should be detailed and the camera usable in low light. As a compact sold on style, there is a large range of quite specific scene modes, plus a few extras for the bargain. However, there's no possibility of shooting in a raw file format or having direct control over shutter speed and aperture. There is a full 1080p video mode, and a high-speed shooting capability of 7.5fps for five consecutive shots. To accompany these capabilities, the Nikon Coolpix S9500 has a 640k-dot OLED screen and comes with a variety of focus modes, including face detection. The compact camera also features an Expeed C2 processor and inbuilt Wi-Fi, offering instant image sharing options. In terms of competition, the camera sits alongside the Canon PowerShot SX20 IS, Panasonic TZ40, Fujifilm FinePix F900 EXR and Olympus VR-370. It wouldn't be a Style camera without a range of colours, and the Nikon S9500 is available in one of four colour options, including our test model of 1960s-chic brown metal. They are all priced at £299.99 / AU$374.95 / US$349.95. If you're after a cheaper option, the Nikon S9500's little brother, the Nikon S9400, costs £249.99 / AU$349 / US$299.95 and comes without built-in GPS or Wi-Fi, with a reduced 18x zoom range. In the hand, the Nikon S9500's body feels substantial without leaving you in any doubt that it is a camera you're meant to have fun with. Next to the shutter button and zoom lever on top of the camera there is a dial for switching between main camera modes. Increasingly rare on modern compact cameras, this is a welcome tactile feature in a world of menus and sub-menus. Most of the controls are on the back of the camera, with a metallic rotating dial for scrolling through settings and images that doubles as a four-way pad. All of the buttons on the back are very well positioned in relation to each other, with the play, delete and menu buttons having a slight cutaway at one edge to enable you to run your thumb around the scrolling dial. The camera is ready to shoot within two seconds of you switching it on. In addition to auto mode, there are four standard scene modes on the mode dial as well as a scene mode auto selector, an effects mode (for in-camera black and white, selective colouring and so on) and a Scene mode that provides access to a further 16 scene modes such as Fireworks Display, Museum and Pet Portrait. There's a nice variety of scenes, but you might need to consult the manual to figure out what they do. Fireworks Display, for instance, will hold the shutter open for four seconds. The panorama shooting function works by having you line up the first shot, and then on-screen instructions will tell you to pan the camera around in one sweeping motion to capture the rest of the shots. The Nikon S9500 will then stitch the shots together automatically in-camera - provided of course you are able to hold the camera steady enough for that one sweeping motion. With no fully manual mode, it's fair to say that the Nikon S9500 is a primarily automatic experience. Though white balance and exposure compensation can be adjusted, there is no way to adjust shutter speed and aperture. ISO sensitivity is adjusted through menu navigation. It would perhaps have been nice to see a dedicated button for making quick changes to everyday settings, as has been the trend recently in some more advanced compacts. Although the main mode dial on top of the camera is a welcome escape from menu navigation, there is the slight sense that Nikon has tried to pack quite a lot onto it, confusing its purpose slightly. Once you've cracked the menu system it is a breeze, but perhaps a touchscreen would have made things more intuitive to users new to Coolpix cameras, especially those stepping up from a smartphone. The traditional four-way pad doubles effectively as a scroll wheel, though unless you are familiar with the camera's way of doing things it can be tricky to know whether to scroll left or click left, requiring some time to get to know the quirks of the interface. That said, the dedicated one-press-to-record video button is nicely placed, and the way of accessing scene modes and effects via the main dial on the top of the camera is very easy to use once you've sussed it out. If the camera's built-in GPS and electronic compass is turned on, geolocation metadata will be added onto your images. This can be especially fun for holidays - roam freely, then view your photos on a map when you return. You can also view it along with normal image previews on the back of the camera. As well as a range of Instagram-style filters to apply to your images in-camera, there is a 3D Photography function, which you use by taking one photograph, moving the camera to one side, then lining the semi-transparent images up on the screen until they match. It's intuitive to shoot, but of course you will need a 3D TV or computer monitor to view the results. Movie recording is very straightforward. If you pause the recording and then resume, the camera will produce one seamless video file. The side of the camera has an HDMI port that can output 480p, 720p, and 1080i video. As with its predecessor, the memory card/battery compartment on the bottom and the HDMI/AV port on the top-right side of the camera both feel strong and secure. The Nikon wireless utility works on Android and iOS devices, enabling remote control of the camera and giving you the ability to browse and import photos over the camera's built-in Wi-Fi. However, you will need a smartphone or tablet to do this, since there appears to be no in-camera direct publishing capabilities. Once you have installed the Nikon wireless utility app on your smartphone or tablet, simply turn on Wi-Fi through the camera's settings and then connect to the camera. You will then be able to browse photos that reside on the camera, or enable live shooting mode via your smart device's screen . Though the Wi-Fi tool works well, the Nikon S9500 lacks NFC (near-field communications) technology present in competitors such as the Panasonic TZ40. Because your phone can't be connected to two Wi-Fi networks at once, if you want to upload photos via Wi-Fi internet (rather than 3G/4G) you will need to first transfer the images from the camera to the smartphone or tablet, then switch back to your regular Wi-Fi network for internet access to put the images on Facebook or Twitter. There is a ridge on the front and a rubber grip on the back, enough to enable you to shoot comfortably one-handed. Autofocus points can be set across the field, to the image centre, or manually with the four-way pad. In keeping with the Nikon S9500's promise to be able to track even fast moving subjects at sporting events, there is a motion tracking AF mode and face detection. Combined with the sports scene mode, which takes up to five pictures at a rate of 7.5fps, the camera is quite capable of getting action shots if you can get the setup just right. Although five shots at 7.5fps is quite a short space of time, you will still have to be quite good at timing your shots. The retouch menu enables you to to add any of the filters after the image has been shot, though you can apply them before shooting using the Effects mode. Exposure compensation can be changed by pressing right on the main scroll pad in any scene mode, although it is called 'Brightness' in Auto mode. The flash charge indicator doubles as a charge LED, because the default way of charging the Nikon S9500's battery is via the camera. If you want a battery charger (in order to charge one battery while using another in the camera) you will need to buy this separately. The results of our labs tests for image quality and resolution, and sample images from the Nikon S9500, are all on the following pages. The Nikon S9500 has a large 3-inch screen of approximately 614k dots, which is significantly lower than its 912k-dot predecessor. However it is an OLED screen instead of an LCD, which helps towards a longer battery life and produces an image viewable even in bright daylight. Reflections are present, but the vibrant OLED does a good job of punching through. For a pocketable compact camera, the Nikon S9500 crams in an impressive zoom range equivalent to 25-550 mm on a 35mm camera. The image stabilisation is very good, enabling clean shots (combined with high ISO) at the telephoto end of the zoom range. The images were kept blur-free and retained detail too, even in low light. In single-shot mode, it's possible to take an image (including focusing time) with just a two second interval. Matrix metering was usually spot-on, but during our tests there were a couple of situations where the camera seemed to struggle for no clear reason. Automatic white balance was generally very good, with the camera judging correctly in a number of difficult scenarios such as street lighting, indoor fluorescent lighting and patches of springtime orange sunlight. There were no visible signs of fringing, distortion or vignetting, so it seems Nikon has done a good job of keeping the optics under control, given the size of the zoom range and the troubles that often come along with that. Filters applied in-camera are all quite sensible and contemporary, if you're into that sort of thing. Black and white images look lovely on the high-contrast OLED screen, and the Nikon S9500 has the option to store two copies of each image you shoot: for example one in black and white and one in standard colour. Macro focusing mode works well, though the camera did have some trouble staying focused on flowers blowing in the wind, as if there is a slight delay between the camera deciding on a point of focus and it actually taking the shot. Generally speaking, the images are vibrant and sharp and display a decent range of shadows and highlights up to the quality you would expect of a decent CMOS sensor in 2013. A good update to the existing Style range of Coolpix cameras, the Nikon S9500 brings the shooting features we are starting to expect of a digital compact, including HD video, outstanding image stabilisation and Wi-Fi capabilities. The range of feature-rich scene modes makes the system quite versatile. Priced at £299.99 / AU$374.95 / US$349.95, this compact is cheaper than most cameras that rival it in terms of zoom range and feature set. But if the Nikon S9500 is still too pricey or large for your pocket, this camera has a little brother, the Nikon S9400. This camera is a good option for someone looking for a pocketable camera with all the bells and whistles that Nikon can muster for this size and price. The Nikon S9500 offers great image stabilisation on a long zoom range for a camera of this size. It looks good, feels nice, and is versatile and compact with a bright screen. There are lots of scene modes to get creative with, and most of the features you could hope for in a camera at this price point. Considering this camera's zoom range and sensor capabilities, it's disappointing not to have the option of more manual control - even if the options were buried a little. In summary, this is a great camera for those already familiar with the Coolpix range of compacts and looking for something that brings those 2013 spices to the table with a solid CMOS sensor. The Nikon S9500 is not the camera for professional photographers looking for a pocketable carry-around camera, though, and the lack of manual controls and raw file format capture are enough to drive you to other products. But it does come in red.